installation savings for the customer, say company officials. 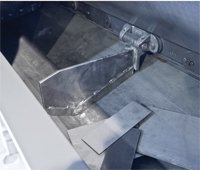 The ScrapVeyor is a fully automated conveyor that uses positive discharge to ensure zero carryover. Its leak-proof construction retains 100 percent of cutting fluids as it transfers scrap up to 300 ft. in above-floor and in-floor applications. Larger rollers keep the flighted chain on track, while rotating flight cams provide minimum friction for cool, prolonged operation. Discharge options include standard chute, automatic or manual pivoting swivel chutes, as well as an automatic or manual tipping chute for use with single, dual or full-size trailers or railcars.